More About This Title What's It Like Out? The What’s It Like Out? series introduces readers to the science of weather. Clear, helpful diagrams support easy-to-read text that brings important concepts to life. Individual books highlight how and why weather happens, from the molecules in the air to the most violent storms on Earth. 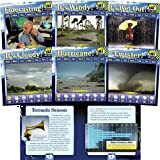 Discover how clouds and raindrops form, why the wind blows, where tornadoes and hurricanes are most common, and how they form. Also, learn about the tools forecasters use to predict these weather conditions. Full-color photographs, bold glossary terms, and an index support this engaging series.